Below are the five basic steps you will be following. 1. Identify an issue that is causing you physical or emotional distress. 2. Focus on your issue and assess the intensity of your distress. 3. Craft and then vocalize a statement that accurately describes how you are feeling, adding an affirmation of positive self-regard. 4. Tap on nine specific points while remaining focused on your issue. 5. Reassess the level of distress after a round of tapping, and repeat the tapping sequence if necessary. Tune into a specific problem or issue you wish to treat. Rate the intensity of your distress on a scale of zero to ten. This scale is known as SUDS, or Subjective Units of Distress. 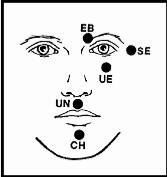 Tap each of the following points 10 to 15 times, while repeating the Reminder Phrase, "this problem": Eyebrow (EB), Side of Eye (SE), Under Eye (UE), Under Nose (UN), Chin (CH), Collarbone (CB), Underarm (UA), Wrist and Top of Head (H). Take a deep breath. Rate the SUDS level again. If your SUDS level is zero to two, you may stop. If it is two or higher, repeat the revised Set-Up Phrase, "Even though I still have some of this problem, I deeply and completely accept myself." Tap all the points again, repeating the revised Reminder Phrase, "This remaining problem." Reassess the SUDS level and repeat if necessary. 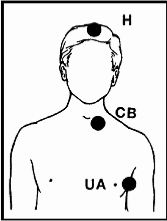 Collarbone (CB): The junction between the sternum (breastbone), collarbone, and first rib. Place your forefinger on the U-shaped notch at the top of the breastbone. Move down toward the naval about an inch and then go to the right or left one inch. Top of Head (H): On the top and center of the head. Tap in a circular motion around the crown of the head.